After seeing Captain America: The Winter Soldier, a friend informed me that Marvel Studios currently has movies slated through 2028. Given how popular the Marvel comic book characters have become with movie-going audiences, this is hardly surprising. In fact, I imagine the date will be pushed out even more, probably through the middle of the century. But with great popularity comes great responsibility, and that means the onus is on the filmmakers to make each installment stand out. Considering their ubiquity, though, I wonder, is that even possible? When anything in life - not just movie genres - becomes so commonplace, it’s difficult to make it fresh and distinct. The Winter Solider, an otherwise acceptable and well-made sequel, unfortunately succumbs to this inevitability. A week from now, I’ll have likely forgotten the specifics of the plot and the state of the characters. I’ll only know there was a plot, which added another layer to the cinematic Marvel universe and that once again disrupted the status quo, forcing the heroes to defend the world from bad guys who have the usual ambitions to take it over. I’ll also remember the movie developed the characters a little more while simultaneously introducing new ones. Such characteristics are more or less standards of sequels, and with The Winter Soldier, they’re serviceable but not exactly special. The movie is basically entertaining and exciting, but I remember a time when superhero movies went beyond “basic.” When we think about Superman: The Movie, Spider-Man 2 or Batman Begins, we think of them as truly awesome, innovative and energetic experiences. I didn’t feel that higher sense with The Winter Soldier. And now that such movies are a dime a dozen, will I ever feel that way again? In order to enjoy these countless superhero films, should I lower my standards? 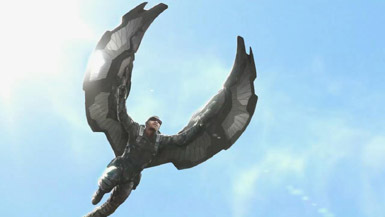 The film takes place two years after the events of The Avengers, and Captain Steve Rogers, a.k.a. Captain America (Chris Evans), has settled into a fairly routine lifestyle of carrying out special missions for S.H.I.E.L.D., which he does alongside the slick and curvaceous Natasha Romanoff, a.k.a. Black Widow (Scarlett Johansson). Both take orders from leading agent Nick Fury (Samuel L. Jackson), who doesn’t always disclose all the organization’s key objectives.